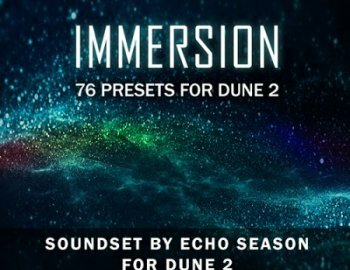 Taking a deep dive into atmospheric depths, Immersion is the debut soundset by the American psybient producer, Echo Season. The soundset contains 76 inspiring sounds for DUNE 2, selected by and released exclusively on the Luftrum label. We invite you to immerse yourself in the fluid audio demos below and be soaked up by ambient washes, bright electronic textures, blissed out pads and vibrant evolving atmospheres. Interstellar beds and nebulous lush pads await to be discovered by the intrepid spacefarer. Characterful plucks and crystalline keys will propel you through the cosmos. Deep subsonic bass underpins the works like a cold fusion engine core – all designed in the sonic range of artists such as Carbon Based Lifeforms, Ascendant, Solar Fields and Martin Nonstatic.